Time-sanctioned performances, of course. Collectors will have most of them in some form or other, though maybe not both sets of Lipatti�s selection of Waltzes and maybe not the subfusc live Liszt. Otherwise the inclusion of the canonic Grieg concerto performance with Galliera doesn�t add much as it�s been re-released so often. Companies such as Andromeda have a knack of undercutting the market by trawling through repertoire and constructing imposing looking boxes. I can�t detect any realistic processing other than that accomplished by the �parent� companies, so to speak. And yet here is a cheaply presented and cheaply functional body of work, note-less and silent as to derivation and provenance, that will try to muscle its way into the marketplace. So one needs to consider it, coldly and coolly. A few pointers may serve to guide the undecided. 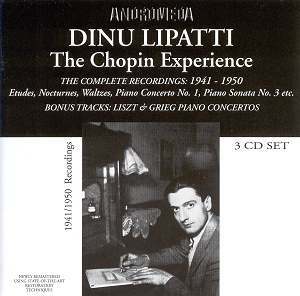 Lipatti�s Op 58 Sonata is a touchstone for many people and it remains for them the greatest recording � dangerous words � that has yet been committed to disc. I couldn�t possibly dissent. In its combination of poetry and constantly changing prismic colours and pedalling it is a reading of the most articulate humanity. The copy from which this transfer has been made was slightly scuffy and had what sounds like an LP pressing bump. The Nocturne in D flat minor, from a London session in 1947 made just a fortnight before the recording of the Sonata, is one of almost unparalleled beauty. Ferociously self- critical though he was one hopes that Lipatti had some measure of understanding as to the true depth of admiration in which he was held during those precious fragile years of his maturity. The disc that houses the sonata also gives us the Bucharest 1941 recording of the G flat Etude Op.10 No.5 � in poorer wartime sound and maybe another less than easily obtainable recording. This disc also contains live Zurich performances from 7 February 1950 � plenty of echo and jangle on these compromised recordings. Lipatti chose his own running order of Waltzes. Two selections are presented here, both very well known. One is from Geneva, the other Zurich, both from 1950 and made several months apart. The Geneva performances are however much the better known and the ones that have circulated for decades on EMI.� The Zurich performances replicate to a very large degree the running order of the Geneva selection but are less well recorded. I�m sure one might quibble with one or two slightly over-emoted internal contrasts but such mean spirited dissention has little bearing on performances so richly characterised and buoyantly alive. These are performances of the utmost grace and beauty, recorded in the brief remission afforded him during treatment for the leukaemia that was soon to kill him. The Chopin Concerto was released on Jecklin JD541-2 where it was coupled with a live broadcast performance of Bach�s concerto BWV1052 with the Concertgebouw under van Beinum as well as some Etudes and the D flat Nocturne Op.27 No.2. Obviously this is the real thing not the Czerny-Stefanska performance that was for so long alleged to be Lipatti. Though the sound is constricted we can hear through it to the heart of Lipatti�s playing. He plays with great beauty of tone and considerable metrical daring, in the first movement especially. The cantabile of the Romanze is ravishing. This is a rare and precious survival. The Liszt is similarly compromised in sound quality with a lot of scratches on the acetates. Still, at certain points Lipatti seems to leap out of the aurally depleted sound-stage like a daemon. The first movement trills galvanise and the slow movement is a study in poetics. Doubtless collectors will have the majority of these performances on parent labels, filled in with such as the Jecklin. Ignoring the fact that this is not entirely the �Chopin Experience� and that we also have the Liszt and Grieg concertos appended as �bonus tracks� these are obviously indispensable traversals.